When your ship docks in St Maarten, snorkel and sightsee around the island on this 2.5-hour shore excursion. Pilot your own 2-passenger inflatable watercraft to idyllic snorkeling locations in Happy Bay and Baie Rouge. Accompanied by the guide boat, the Rock 'n Roll, you'll explore the island's scenic waters while enjoying cold refreshments. Snorkeling equipment and round-trip transportation to the cruise port is included. When your cruise ship docks in St Maarten's port, disembark and meet your guide and tour group. Transfer to the launching point for your day's excursion. 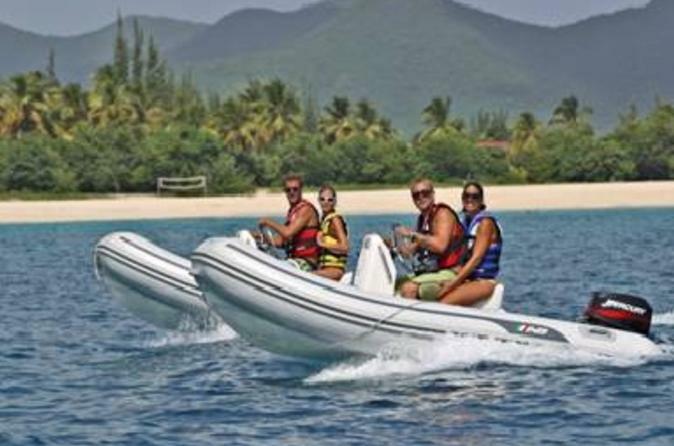 We will ensure your excursion ends with ample time for you to return to Port of St Maarten for your ship’s departure. In the rare event your ship has departed, we will arrange for transportation to the next port-of-call. See our terms and conditions for full details.